Thank you to everyone who came out and made this year's "A Day With the Prophets", a great success. This was our FIFTH year, and Thank Allah, it keeps getting better! Believers came out from many communities to share and partake in the fruitful spiritual knowledge and wisdom that was shared throughout the weekend. A SPECIAL thanks goes out to all of our speakers, Imam Jihad Saafir, Imam Malik Mubashir, Sis. Maisha Aziz, Esq., Sis. Ayesha K. Mustafa, Imam Abdul Azeez, and Imam Salim Mumin. We hope to see you there next year! Masjid Freehaven is an Islamic Community in the Association with the Leadership of Imam W.D. Mohammed, which proclaims the Universal Message of Al-Islam and that there is but one God and we are all one human family. Masjid Freehaven was founded by a group of 12 Muslim families who for the most part lived and worked in the Lawnside area. The families came together regularly to celebrate their Iftars (breaking the fast) and Ends (Islamic Holidays), meeting in each other’s homes, sharing and discussing the needs of the growing Muslim community. As the gathering grew larger we began discussing the need to open a Masjid in the Lawnside area. In the interim, we began meeting in our homes, businesses, schools, etc. We started conducting classes where we began teaching our children the tenants of Islam. Allah (SWT) blessed us to eventually find a location that would become the home of Masjid Freehaven. Once the property was located, the families sacrificed and raised the money to purchase to property outright. Over the next nine years the building was slowly renovated and refurbished by a few dedicated brothers and sisters. The building which formerly was a nursing home and then a church became known as Masjid Freehaven. Masjid Freehaven’s name was chosen to commemorate the historical significance of this African-American community. The town was once known as Freehaven and was home to the Underground Railroad. During the time that the building was being renovated, the small Muslim community began organizing and functioning as an Ummah, establishing a Shura board, selecting a resident Imam, and conducting weekly Taleems (religious educational services) in various homes and businesses. Masjid Freehaven was officially opened Friday May 16th 1999, after 9 years of hard work and dedication. For the grand opening, the late Imam WD Mohammed (son of the late Elijah and Clara Muhammad, founder of the Nation of Islam) traveled to Lawnside to officiate in the ceremonies. During his visit he was presented with the keys to the Masjid. Also present and to lend support to this historic occasion was the then State Senator Wayne R. Bryant and Borough Council President Mary Ann Wardlow and other borough officials. Ms. Wardlow now serves as our Mayor. Also present that day were many visiting Imams, fellow Muslims, our beloved pioneers who traveled from the surrounding areas to help celebrate this auspicious occasion. Masjid Freehaven’s mission is committed to presenting, teaching and practicing AL-Islam in a clear and balanced way, never given to extremes and working for the good of humanity through collaboration and mutual respect with all right-minded people. "Invite all to the way of our Lord with wisdom and beautiful preaching, and argue with them in ways that are best and most gracious for your Lord knows best who has strayed from his path and who receives guidance." ​Our Mission is to establish a balanced community life in the broadest sense, witnessing the eternal wisdom of the Holy Qur'an and the life example of our beloved Prophet Muhammad (Peace be upon him). We will strive to cultivate the patterned growth of human excellence and good character through building valuable relationships with all God conscious people. What are the Five Pillars? Al-Islam is the complete way of life that reflects Submission of the Will of God. Islam means submission, derived from the Arabic word "Salaam", meaning "Peace". Muhammed the Prophet was born in Mecca, the holiest city to Islam in Arabia in the year 570 or in the 6th Century. 5) Hajj or Pilgrimage to the Sacred House, the Ka'bah, in Mecca, Saudi Arabia, at least once. The Qur'an is the last revealed Scripture from God and the primary source of the Muslim's Faith. Check out our current events and up to the date news at the Masjid. "O you who have believed, when [the adhan] is called for the prayer on the day of Jumu'ah [Friday], then proceed to the remembrance of Allah and leave trade. That is better for you, if you only knew." ​We have made it convenient for you to pay your Zakat no matter where you are! ​Missed Jumu'ah, or want to hear a khutbah again? We've got you covered! ​"O ye who believe! When the call is proclaimed to prayer on Friday (the Day of Assembly), hasten earnestly to the Remembrance of Allah, and leave off business (and traffic): That is best for you if ye but knew!" Our Annual conference is a retreat from the daily pressures and anxieties of our lives as we reflect and examine the lives and challenges of the Prophets sent by G-d. It is our intention to rejuvenate and inspire the participants by providing information that compares and contrasts the life examples of the beloved Prophets of G-d & Life in the 21st century. 2019 Video Recap Coming Soon! He was a tireless laborer for the interest of peace and justice in our world, as he has worked for and realized direct and genuine dialogue between people of all races and religions. Outstanding the purveyors of narrow race concerns, Imam Mohammed’s leadership continues to build upon solid religious foundation with concrete plans into the next millennium for the strengthening of families, neighborhoods, and communities. Imam W. Deen Mohammed was unanimously elected as leader of his community after the passing of his father in 1975; The Honorable Elijah Muhammad, founder, leader, and builder of the Nation of Islam. At a very early age, Imam Mohammed developed a keen scholastic interest in science, psychology and religion. He began his education, from elementary through secondary school, at the University of Islam in Chicago. Further educational pursuits took him to Wilson Junior College, where he concentrated on microbiology and the Loop Jr. College where he studied English, history, and the social sciences. However, his primary education has come from, and through, his continued pursuit of religion and social truths. 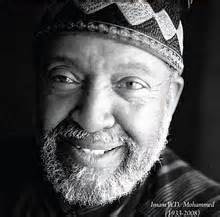 Imam Mohammed’s astute leadership, profound social commentary on major issues, piercing scriptural insight into the Bible, Torah and Qur’an and his unique ability to apply scriptural interpretation to social issues have brought him numerous awards and high honors. He is a man of vision who has performed many historical “firsts”. In 1992, he delivered the first Invocation in the U.S. Senate to be given by a Muslim. In 1993 he gave an Islamic Prayer at President Clinton’s first Inaugural Interfaith Prayer Service and again in 1997 at President Clinton’s second Inaugural Interfaith Prayer Service. His strong interest in in interfaith dialogue led him to address the Muslim-Jewish Conference on March 6, 1995, with leaders of Islam and Reform Judaism, in Glencoe, IL. In October of 1996, Imam Mohammed met John Paul, II at the Vatican, at the invitation of Archbishop William Cardinal Keeler and the Focolare Movement. He met with the Pope again, on October 28, 1999, on the “eve of the New Millennium” in St. Peter’s Basilica with many other world-religious leaders. In 1999, Imam Mohammed served on the Advisory Panel for Religious Freedom Abroad, formed by the Secretary of State Madeline Albright. He assisted in promoting religious freedom in the United States and abroad. changing the face of freedom and education in America forever. praying for the day that we can open a full time Islamic School for the children in South Jersey.